Andrew and Kara Waller say what they have learned owning the restaurant will serve them well in their next business venture, whatever it may be. GARDINER — Despite the sign on the door and the upended booths inside, people recently walked into Dennis’ Pizza expecting to order a sandwich. They were out of luck. After more than 30 years, the iconic restaurant on the Bridge Street bridge has closed its doors, and owners Andrew and Kara Waller are getting ready for the next phase in their lives. Kara Waller started work this week at Regional School Unit 12, where her goal is to be an educational technician 3; and Andrew Waller is making the rounds with his resume. When they bought the business four years ago from Dennis Wheelock, this is not where they thought they would end up. Andrew, 46, and Kara, 40, had planned on the restaurant carrying them through retirement. 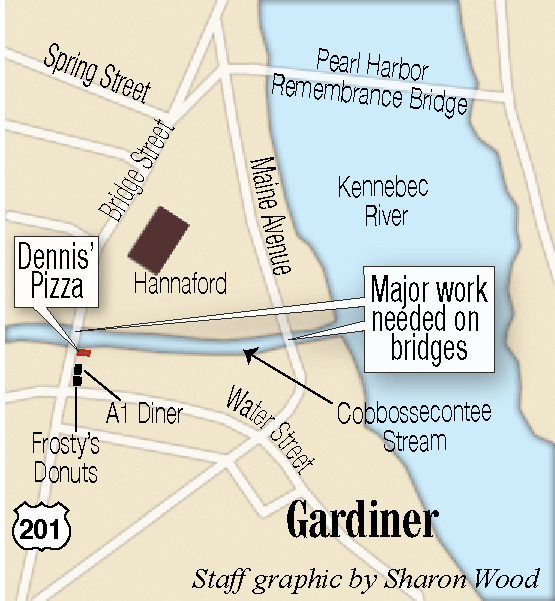 But in August 2013, when they bought the restaurant, they didn’t realize that the replacement of the Bridge Street bridge might overtake their building. An increase in the state’s minimum wage on Jan. 1 was not on the horizon. 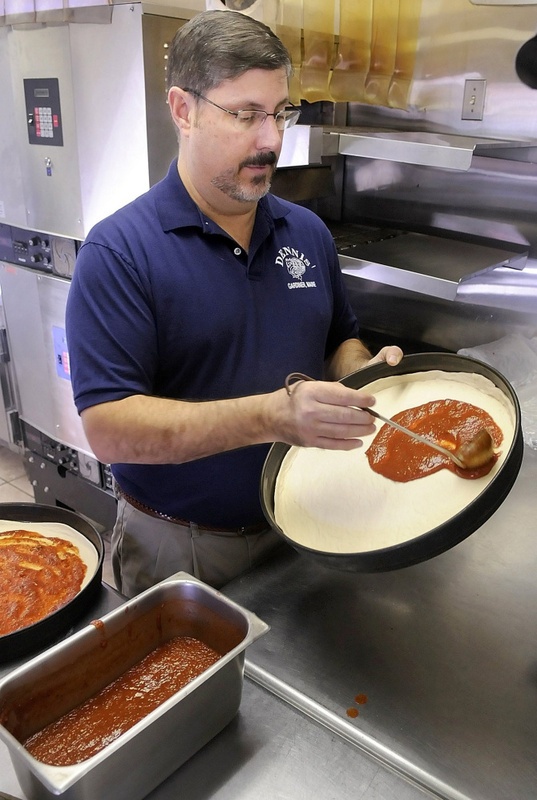 And competition from a national pizza chain taking such a big bite out of their revenue was not a consideration. Andrew Waller said he’ll never forget the day, just over four years ago, when the deal for the restaurant was done. “We closed, handed over the check and shook hands with the lawyer; and the next morning, we unlocked the doors and the customers started flowing in,” he said. On Saturday, the Wallers took a break from cleaning and moving to talk about the time they spent at Dennis’ Pizza and what they have learned. Andrew Waller, who grew up in Hallowell, knew his job as a manager at the Staples office supply store in Augusta, where he had worked for a decade, would be eliminated, as other jobs in the company would be. 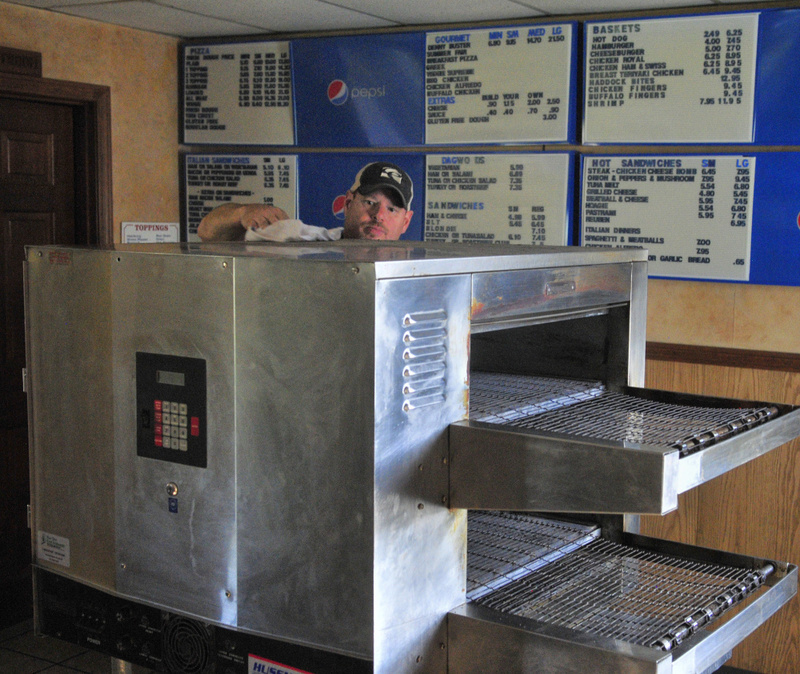 Dennis Wheelock, a longtime customer of Waller’s who owned the restaurant, asked if he was interested in the business. “We are driven people and we love to work,” Andrew Waller said. Owning a business wasn’t all foreign territory. 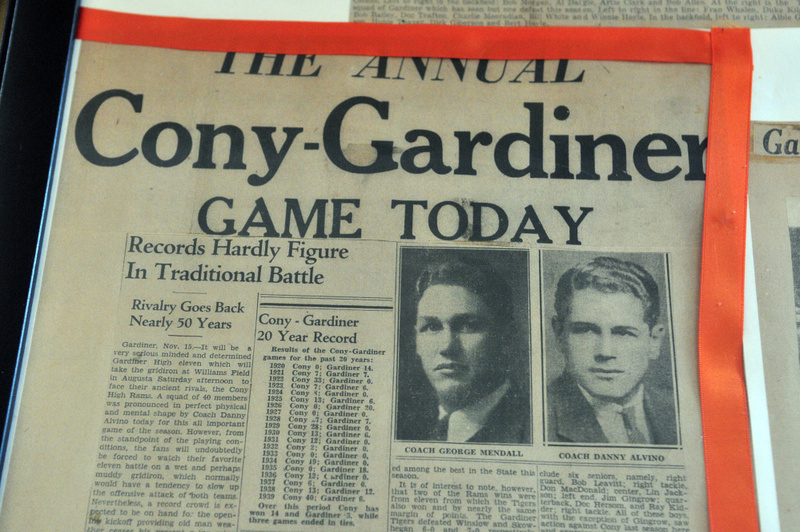 His mother ran a business for years, as did Kara Waller’s father. Kara Waller also had operated a photography business and a concessions business. She grew up in Whitefield and went to school in Gardiner, and Dennis’ was the place to go, and the place to work. What the Wallers didn’t know about running a restaurant, they learned on the fly. “Operationally, I was extremely naive,” Andrew Waller said. He was at home with hiring and training, talking to customers and working the house. But the business side, which became Kara Waller’s domain, was entirely different. “I had never even seen a Quickbooks page, and now she’s an expert on it,” he said. “In the beginning you have this fantasy, that this is our business and these are our employees,” she said. The reality is there are bills to juggle and the inevitable questions from the staff and customers, even on days off. Equipment needs fixing and customers need to be served even if the owners are not pulling regular paychecks for themselves. And parenting two young children while doing everything else was often a complicated dance. All of that bumped along until a little more than a year ago, when representatives from the Maine Department of Transportation approached the Wallers as the plans for the bridge replacement were starting to take shape. 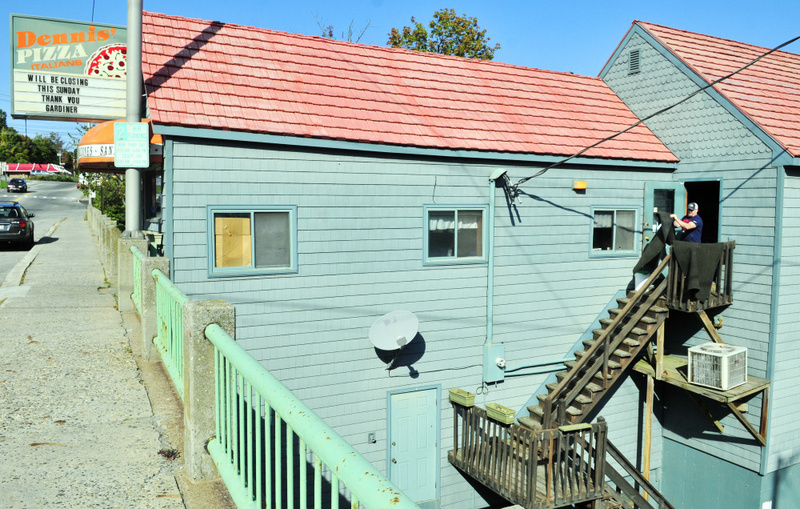 The green shingled restaurant with the red roof might be the only building attached to a bridge in the Northeast, and preserving it posed some challenges to project planners. Meetings were held, options were considered. Some were impractical and others were unworkable. After entertaining a number of options, Kara Waller said it came down to closing the restaurant for the duration of the project, which might be as much as eight months of lost business and income, or relocate. Shutting down temporarily wasn’t feasible, so in the end, in January, they decided to relocate. Even as they started searching for another location, other factors came into play. In January, the state’s minimum wage increased from $7.50 to $9 an hour, causing wage compression because new workers were getting paid as much as longstanding employees. And as 2017 progressed, it became clear that competition in the form of Domino’s, the national pizza chain, which opened a restaurant in June, was moving in. When they couldn’t find a suitable new location, they opted to close the business. Now the building stands vacant or nearly so. The Wallers spent last week and the weekend pulling out equipment, supplies and furniture with the help of friends, and getting the building ready for its inspection by the Department of Transportation. Both the Maine Avenue bridge and the Bridge Street bridge are scheduled for replacement in 2019. State transportation spokesman Ted Talbot said the building will be removed to make way for the new bridge. Plans now call for a new bridge superstructure to be built on temporary supports on the downstream side of the bridge. It will slide into place after the existing bridge is removed in the second phase of the project. The Maine Avenue bridge will be replaced first. Area residents consider the building a landmark, as both a long-standing restaurant and a high-visibility building that’s used when giving directions. When it’s gone, it will leave a void. Karen Kidder, who lives across the river in Randolph, used to go to the restaurant in the 1970s, when it was still Joe’s Pizza, and she’s sad to see it go. Kidder said Tuesday it’s too bad relocation plans didn’t work out. The Wallers walk away from Dennis’ Pizza with some ideas for the future, some lessons learned and a little advice. Kara Waller said she came into the business thinking dollar signs, but she has learned that the only way they’ll be provided for is through God. One of the opportunities they had been considering has started them down that path. In 2016, the owner of Sheepscot Links in Whitefield had approached them about opening a satellite location at the golf course, and this summer, they took him up on it. Wildcats & Links opened on July 1 through Labor Day, when they shut it down so they could close the business in Gardiner and vacate the building. Even with the short season, they were pleased with the results. The Wallers have learned to be business partners as well as partners in marriage, and that will serve them well when they launch their next venture. Because there will be a next one. “We are so much stronger,” Kara Waller said.